Shirley of Creative Deeds Reads and Deeds Graphic Services will once again be offering her creative services for our International Grand Prize. One lucky participant will be able to create their choice of bookmarks, business cards or a design for their blog. The rules are simple. 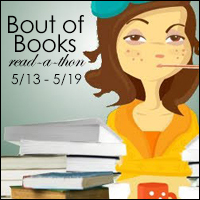 You just have to have officially signed up (direct link added to the sign-up linky) and be an active participant in Bout of Books 25 (we will be checking) and that’s it!